The first round of the FIA European Rally Championship finished on Saturday on the Sao Miguel Island – the largest one in the Portuguese archipelago of the Azores. The Russians are fighting for the European Champion titles and two crews of the Russian Performance Motorsport team, the first from St. Petersburg and the second from Ekaterinburg, are taking part in this season. The race ended with the triumph of Alexey Lukyanuk / Alexey Arnautov crew – they secured a flawless victory at the Portuguese round, ahead of local driver Ricardo Moura, who was not only the champion of the Azores, but also this rally winner. The second team crew of Sergei Remennik and Mark Rozin took the second position in the production cars category ERC2. The race was held in a three-day format and the organizers raised the level of complexity from day to day consistently. On Thursday the drivers tackled 23.17 km of special stages, on Friday – six special stages with total distance of 76.7 km, and Saturday closed the rally program with another six SS with a total length of 107.57 km. So for three days the racers overcame 15 special stages and 207.44 km of competitive distance. The first half of the final day was fruitful for Alexey Lukyanuk, although it was not easy to hold the lead: a leakage occurred in one brake caliper, and the crew’s Ford Fiesta R5 quickly lost brake fluid. So guys had to block the brake line by means turned out to be at hand and continue driving, braking only with three wheels. Alexey Lukyanuk, “In one of the corners the car turned around, and we lost about ten seconds, but nevertheless we are on the right tyres and feel confident. I changed the car settings a little and it helped me to find a good pace, without risking. We have even slightly increased the advantage over our rivals, so we must finish this day fairly confidently and carefully”. The final three stages of the race passed for the Russian crews fans in a nervous expectation of the finish, but Lukyanuk justified hopes and finished without time losses for the first position. The second section started for the crew in the Mitsubishi Lancer Evolution with a confident attack and attempts to win back the necessary seconds. But like the last year, the final special stage of the rally was decisive for the crew. At SS-15 the car at full speed hit a wheel against a rock in the same place as Alexey Lukyanuk’s car last year. The steering wheel got crooked, the wheels were turned in different directions, so Remennik was afraid that he would eventually lose the wheel, failing to reach the finish of the special stage. 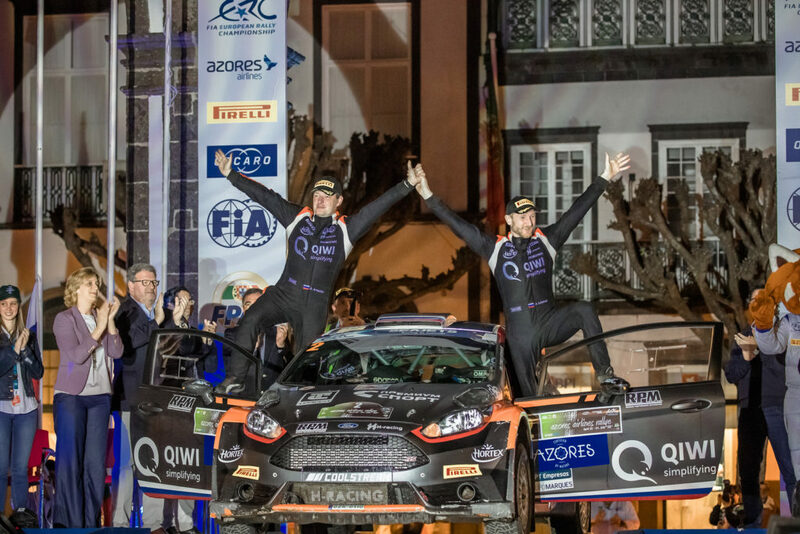 But the rally ended on a high note, because the crew was able to achieve the goal – to finish on the Azores, not surprising the fans with their “achievements”. The leadership on the first rally day brought seven bonus points to the crew collection, in addition to the points that it will receive for the finish in the second position in the category. Now there is a little more than a month break in the FIA European Rally Championships – the second round, Rally Islas Canarias, will be held from 3 to 5 May on the islands in the middle of the Atlantic again.